The neck of the Queen Mary harp is delicately outlined with lines and circles which look similar in technique to the soundboard lines. (Picture from RBA 1904, click to enlarge). This is a very similar decorative scheme to the underlying layer of decoration on the neck of the Trinity College harp. The underside of the neck has beading carved along it. 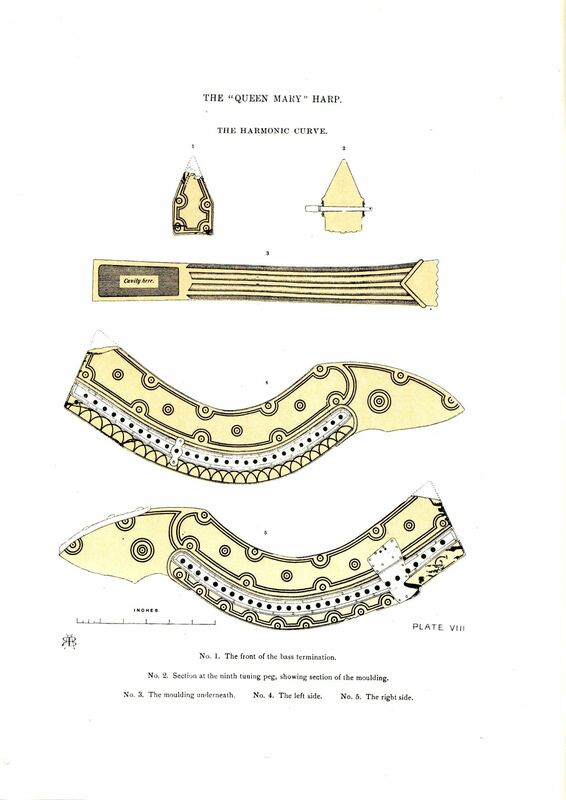 Groups of nails in the sides and ends of the neck show where plaques or badges were once fixed. These badges were mentioned by Gunn in his retelling of the family traditions about the harp. The neck bears the brass cheek bands and tuning pins. The cheek bands have simple lining engraved on, and the pins have engraved bands around as well as incised patterns on both the drive ends and the string ends. 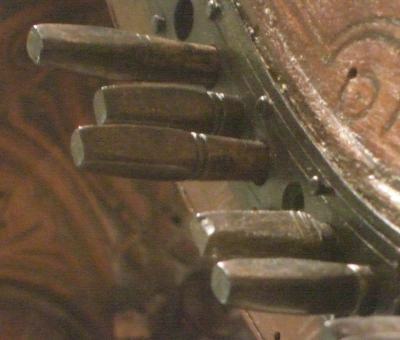 The drives of the tuning pins are rectangular, rather than the much more common square ends found on the other old harps.